SOG Knives and daggers of all types. We carry Medieval Battle Ready Daggers, Scottish Dirks, Cold Steel knives, Colt, Military Knives like Dark Ops, Leatherman, Mission Knives, Smith and Wesson, SOG, Spyderco, United Cutlery Knives, Gil Hibben Knives, Bowies and Survival Knives. SOG Pentagon. 9 3/4" overall. 5" AUS-6A stainless (RC 56-57) double edged blade. One side of blade is serrated, other side is bevel edge. Contoured black checkered Kraton handle with stainless collar and lanyard hole. Includes black kydex sheath. Sog Seal Pup Elite Black TiNi Blade W/Kydex Sheath. 9 1/2" overall. 4 1/2" partially serrated black TiNi coated AUS-8 stainless blade with spine rasp for notching, filing, and thumb placement. Injection molded glass reinforced handle with finger grooves and scored with grip lines. Includes black Kydex sheath. SOG Seal Knife is 12 1/4" overall. It has a 7" powder coated AUS-6A stainless blade with (RC 56-57) hardness and features 1 1/2" serrated section. Contoured black Zytel handle with lanyard hole. Includes black Kydex sheath. Designed for the Navy Seals. SOG Banner Button Lock Knife is USA made. Knife is 4.5 inches closed with a 3.5 inch black TIN coated CPM S35VN stainless clip point blade. Knife is 8 inches overall. Features a black anodized aluminum handle with thumb stud, pocket clip, lanyard hole and a SAT assisted opening system. 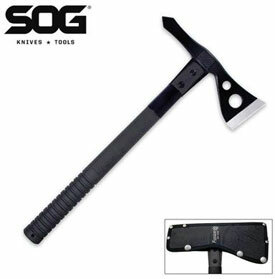 SOG Tactical Tomahawk for sale is manufactured by SOG Knives who based the design upon the Vietnam Tomahawk. 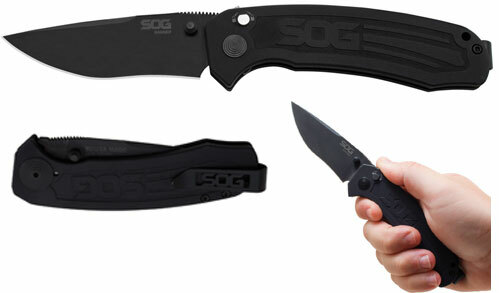 SOG updated this design into a contemporary and functional tool. The Tactical Tomahawk measures 15 ¾ inches in all. Popular with the military, it features a black Hardcased coated 420 stainless steel axe head. The blade measures 8 ¼ inches and features a 2 ¾ inch cutting edge with an RC Hardness of 51-53. The straight style axe head is mounted to the handle with heavy duty bolts and a steel ferrule for stability. The handle is a tough fiberglass reinforced nylon material. For the utmost in function and tactical performance, they feature side hammer checkering which assists in proper placement when pounding. In order to easily carry the 24 ounce Tactical Tomahawk in the field, they also include a nylon sheath. These versatile survival Tomahawks are an excellent companion for camping, military operations and tactical use. Buy the SOG Tactical Tomahawk for $49.99.